This digital document is an article from Performing Arts & Entertainment in Canada, published by Performing Arts and Entertainment in Canada on January 1, 1999. The length of the article is 748 words. The page length shown above is based on a typical 300-word page. The article is delivered in HTML format and is available in your Amazon.com Digital Locker immediately after purchase. You can view it with any web browser. This digital document is an article from Performing Arts & Entertainment in Canada, published by Performing Arts and Entertainment in Canada on January 1, 1999. The length of the article is 554 words. The page length shown above is based on a typical 300-word page. The article is delivered in HTML format and is available in your Amazon.com Digital Locker immediately after purchase. You can view it with any web browser. 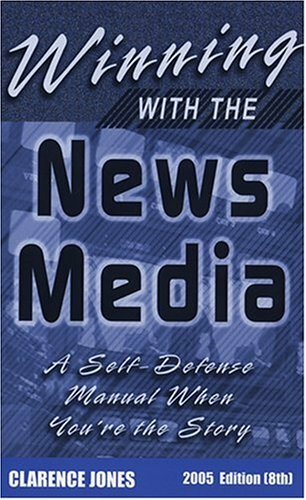 Winning with the News Media by Clarence Jones is, as he has properly subtitled: "A self-defense manual when you're the story." The book is for anyone who interacts with the media and for anyone who may deal with the media ... and let's face it, as law enforcement professionals if you haven't been thrust into the camera's unforgiving eye yet, you will be soon. The media and law enforcement have a long and storied history together - we need them, they need us, we don't trust them, they don't trust us, we avoid them, they chase us ... you get the idea. You can make that relationship better (or at least less nerve-wracking for you) through preparation and knowledge. Jones offers knowledge of media relations from the insider's point of view - as a former newspaper and broadcast journalist, Jones offers insight on not only how things work, by why the media do the things they do. And then to tie it up with a pretty bow, he tells you how and why you should do an interview, a press release, a press conference, deal with a crisis, pick a PIO, do damage control, and make heads or tails of media law. While the book covers many, many topics, Jones does a good job breaking it down simplistically and with bold-faced subheads generously placed throughout the book so it can truly be used as a manual on the fly. He divides Winning with the News Media into three sections: Strategy, Skills and Inside the Media. The Skills Section will be most valuable to chiefs, sheriffs and PIOs as it offers instruction on how to give good un-misquotable quotes in interviews as well as how to look and sounds one's best during an interview. He offers guidelines in the form of Ten Commandments and also addresses such hot topics as "off the record." 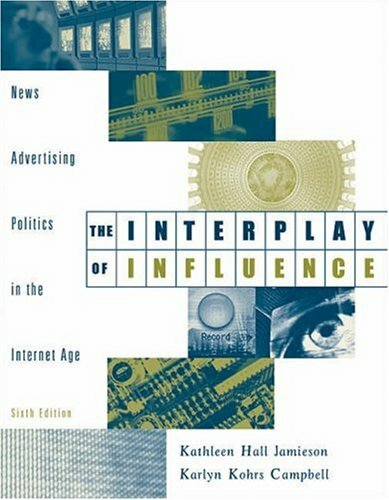 This book is used as a textbook in many media relations classes, ranging from government agencies to corporations. Therefore, it is broad-based. This is not a manual exclusive to law enforcement, although Jones does throw in some references and offers some examples using law enforcement agents. There are certain sections that you'll need to tweak-as-you-read, for example, crisis management. While the book suggests how a corporation would react and respond to certain crises, it's not too far off from how a chief or sheriff should handle such a situation. But because topics like evidence preservation and investigative integrity are not included in the sample plan, one should just mentally add those and like components in. Jones also offers a section on privacy laws, briefly summarizing some cases that established the rights of journalists and their cameras. The topic is important, as undoubtedly at some point in your career a reporter will tell you that he or she is entitled to gain entry or to access some information based on such-and-such a case ruling. Be prepared and know what they have access to and what they don't have access to - again, you can use this book as a reference guide for quick look-up. Winning with the News Media would be most beneficial to command staff level officers as well as those who deal frequently with the media, like persons crimes detectives. The ones to get the most use from this book would be PIOs and agency heads. One should definitely read this book prior to assuming a PIO position not only for the practical tips on dealing with the media but also for the insider's view on how the media work. Jones provides a sort of organizational chart of newsrooms which will make it so much easier to figure out not only who to talk to about what type of story, but also to figure out who has got the authority to deal with your complaints. Agency heads might also want to pick this book up so that when the time comes to deal with that inevitable crisis, you'll have the knowledge to know what you'll be up against. And then when you're facing the crisis (and the cameras), using the book as a reference manual will be that much easier. One "keep an open mind warning": the writing structure is very basic and very simple which some seasoned PIOs and media-savvy chiefs might find a little condescending. However, if you look at it as a how-to manual then you will see why that simplicity is so important - the wording is clear and concise and the directions are easy to follow. Think of any complex piece of furniture or children's toy you've ever tried to put together - how many times have you wished for simple directions? This manual will help you get the job done and you won't have any of those "extra" pieces lying around. Jones does a great job of teaching people how to "win" with the media as opposed to "surviving" or "defeating" the media. That mindset change is key for most people. I learned many new tricks of the trade from reading his book. The Publicity Hound says "2 thumbs up!" If I had to pick only one book of the hundreds written on how to deal with the media, this would be the one I'd recommend. In fact, when I reviewed an earlier edition of this book several years ago for my newsletter, The Publicity Hound, I said that this was the book I wish I had written. As a former newspaper editor who worked in the business 22 years, I thought I knew it all, and more. I didn't, particularly when it came to TV. I couldn't put the book down. Clarence Jones, a former award-winning investigative reporter in both newspapers and TV, knows his stuff, including all the tricks reporters use to loosen your lips. The book is pithy, with easy-to-read chapters broken down into numerous sub-heads--making it easy to find exactly what you're looking for in a hurry. Jones takes you inside the heads and brains of working journalists. He explains how they think, how they react, and what they have the power to do to you if you don't play by their rules. I read an earlier edition from cover to cover and referred to it so often in my consulting practice that the book literally fell apart from use. When I scanned this 8th edition, I got lost in it AGAIN, long past my bedtime. Reading it will make you much smarter, much savvier and much better prepared to meet the media when bad news strikes. Even if all the stories about you are good (yeah, right), please don't do another interivew unless you read this book first. If you deal with the media then you should have read this book already.I read Michael Levine's Guerrilla PR Wired, a brilliant book on PR, and then read Winning With The News Media.Both were influential in my career. Do you think shamed journalists Jayson Blair and Stephen Glass were rare bad apples? Far from it, they were just the ones stupid enough to get caught. Alexandra Kitty demonstrates with example upon example how manufactured news is endemic in our media and shows the reader how to spot suspicious stories. In the last few years, the journalism industry has cut costs by eliminating important safeguards: companies have reduced the number of fact-checkers, editors, and journalists. What this means is that editors and reporters cannot spend time verifying information. Moreover, journalists are not required to have professional experience or training to cover their beats. Fierce competition to get a scoop may lead to journalists making careless errors or not double-checking information. To maintain audiences and readership, journalists, editors and producers will choose sensational stories that “shock.” Combined with time and budget constraints, journalists may unwittingly or deliberately disseminate false or misleading information to the public. It is important to “get” a story, interview a subject or nab a scoop first—the accuracy of these elements is secondary. Competition from other media outlets also means the goal of a journalist is to get the scoop first—how it makes it on the air (flawed, inaccurate, questionably obtained) is unimportant. Don’t Believe It! teaches news consumers how to verify information. It shows readers how to evaluate sources, eyewitnesses and data. This is a comprehensive bible to information verification from a logical standpoint, showing how to be skeptical without being jaded, step by step, with case studies and a classification manual. For me, not being a reporter, the most interesting and useful part of this book is Section One entitled "Introduction to Evaluating the News". 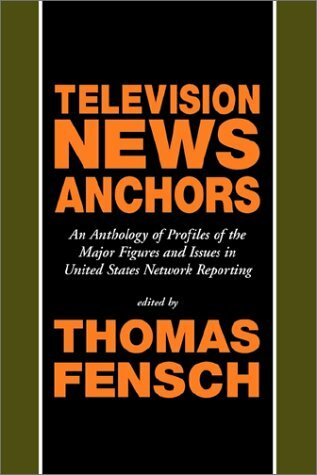 In these first 5 chapters we get a nice glossary of the news business, how reporters obtain and disseminate news and, more importantly, we find out about the real-world limitations they live under. In short, they're always under time pressures and the news business exists to make money. So their motivation is to get an exclusive (a 'scoop') and management's motivation is get the largest audience & cut corners (and hence save money) on those pesky non-essentials like fact checkers, research etc. 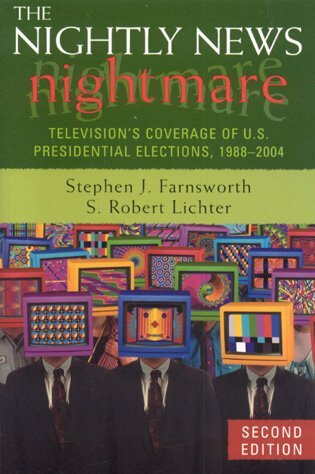 Most of the rest of the book consists of snippets of news stories detailing how the media has been duped at various times. At the end of each chapter we get an itemized list of how these fake stories could have been spotted. Handy to have, I suppose. Reading these case studies I couldn't help but think "there can't be THAT many people out there who are deliberately trying to deceive news organizations". But maybe there are? A devil's advocate could see these as one-off events or rare aberrations not the norm. Essentially what we get is confirmation of McLuhan's observation that news is not something that exists "out here" but is something created in the 'sausage factory' called a newsroom. If you know how the media works and the pressures they're under then it's easy to fool them especially if you put your mind to it. After reading this book I'm inclined to be a more critical reader/media consumer so as not to swallow everything presented. Since the examples presented are individual news stories used to illustrate a specific point it's easy to draw the conclusion that these hoaxes are a result of deliberate bad actors. But what about the case where large organizations with lots of money and resources (read: the military, government, corporations) systematically mislead & manipulate the media to advance their cause? How do we spot that? This very important subject is not discussed by Alexandra Kitty. This is a significant omission IMO as this stuff is also "lies that become news" except they're big lies as opposed to mostly smaller, individual lies found in the book. It would have been v. useful had the author included a detailed discussion of the methods used to manipulate public opinion as developed by Edward Bernays, the founder of public relations. His techniques were developed in the 1920s and 1930s and are still in use today. Everyone should read his 1928 book, Propaganda. I would also commend the excellent books by John Stauber and Sheldon Rampton. 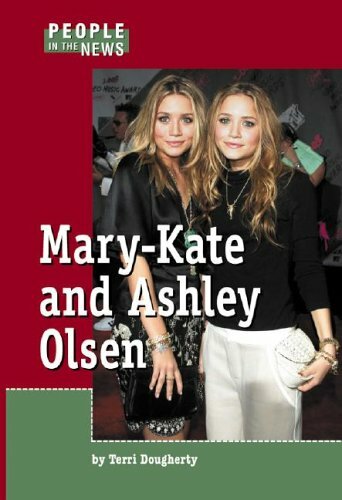 This book was purchased for a college English class that combined journalism with traditional English. I was hesitant about reading it at first, thinking it would be a sensationalist book preaching about how everything is a lie and such. In fact, I found that I really enjoyed it. Thankfully void of neither a left nor right wing bias, and all together facts, not opinion. It really makes you think and consider what goes on in the media today. It amazes me how many things news outlets get away with. As Kitty points out, they're in it to make money. I definitely began looking closer at the news after reading this book. It was very interesting, and readable. This book looks at how, and why, so many scams, hoaxes and other falsehoods seem to make it into the news. If there is such a thing as The Reason for such a state of affairs, it is that, in general, journalists don't bother to check a story's accuracy. In this 24-hour-news world, there is little, or no, time to be thorough. It is better to be first than right. If a story has been covered by some other media outlet, it must automatically be legitimate. Also, an increasing number of scam artists have learned to package their scams in a media-friendly way. All of us have seen such stories in the news. Some people claim to have found disgusting things in their food, like needles in soda cans, or fingers in chili. During Gulf War I, there was the widely reported accusation that Iraqi soldiers burst into Kuwaiti maternity wards, took the babies out of incubators, left them to die on the floor, and took the incubators. A popular story is the one about a crime victim, or someone, especially a child, fighting some major disease. Whether or not the poor individual actually exists tends to be forgotten. What if the reporter is the one who says they are sick, but then it turns out to be a lie. How many of these stories turn out to be true? Included are a list of questions that the media consumer can ask to help weed out the hoaxes. How well is the story sourced? Is the story over hyped? Is the rumor inflammatory or slanderous? Does this interview subject have something to gain by lying? Was a "friend of a friend" the origin of the rumor? Does the story rely on unnamed sources? In war zones, does one of the warring sides seem to have media training or have hired a public relations firm? This book belongs in every home in America. It does a fine job of showing just how easily scams and hoaxes can become news, and helping the consumer to distinguish them from legitimate news. The writing is first-rate and it is really easy to read. Many of us have noticed how instead of news, we get more and more sensationalism, opinions, staged news, and complete hoaxes.We see a few accusations of a "liberal" or a "conservative" media.But that misses the point; what we really have is a lying media.A media for which truth has become an enemy rather than a value.Of course, ratings are the goal, and truth may well interfere with that goal, at least in the short term.And we see some folks even claim that truth is just relative anyway (and only in the eye of the beholder).But it isn't.There is such a thing as honest and accurate reporting.And we consumers need to have a way to say so, objectively, when we're not getting that. I think people of all political persuasions need to read this book.I'm a liberal, and I found myself sympathizing with some of the author's complaints politically.But I would have sympathized with some of them had I been a conservative.I was impressed by the way that the author analyzed bad reporting independent of its political stance. I was especially intrigued by the section on propaganda.Here, Kitty shows us how the media feed us an overdose of dubious anecdotes, demonization, and material from which relevant parts have been censored.We see stories with all sorts of logical holes that are simply designed to get a reaction from the audience rather than report accurately, educate, or inform.And we are misled by straight-faced claims that are utter nonsense, such as that prosperity for one side in a struggle would be a violation of rights for the other side. I do not know how thoroughly the author takes her own advice.But we certainly ought to! Alexandra Kitty reveals as true, what a growing number of people have long suspected: the media reports their biases, not the facts. Senior news directors at most TV stations, and editors at most news papers have biases and prejudices that lean heavily toward socialist economics, left wing social engineerning, and support for other destructive agendas.The journalism schools know this, and teach students accordingly. The result is that colleges and universities no longer train people for jouralistic or fact-gathering excellence -- instead, they filter out all but the most extreme leftists from the ranks of prospective news reporters and editors. Creative writing has replaced facts. Alexandra Kitty shows how extremist feminism, pro-abortion reporting, extreme anti-business views, environmental radicalism, support for pedophilia and homosexuality, and several other radical views have become "mainstream" in media reporting, as the content of "news" has increasingly become tendentious and misrepresentative.Ms. Kitty documents how the media have all bue abandoned fact-based reporting in favor of sensationalism and selective presentations of carefullly arranged facts that serve as propaganda for the causes favored within the culture ofmodern media.She also shows how the media's internal culture has become increasingly isolated and removed from the real mainstream views and experience of most Americans. The most extreme media views are the product of what Roger Kimball termed "tenured radicals" (in his 1990 book of the same title), and what Allan Bloom identified as "the closing of minds" in his landmark 1987 tome.The top editors and content directors in the American media long ago closed their minds to facts, and insisted on political correctness as a condition for promotion or advancement in their organizations.Newly hired reporters and college graduates quickly learned that sensationalism and left-wing reporting (even if it was full of outright lies) were a ticket to advancement, while balanced or objective reporting that stuck with the facts led to a stalled career. The result has been a series of high profile cases where top reporters have been caught reporting complete fabrications, and gettign off with just a mild reprimand. Ms. Kitty shows that the cases of Jayson Blair and Stephen GLass were not unusual; what was unusual is that they were careless and left a broad paper trail that led to them being caught in their own webs of fabrications and falsehoods. 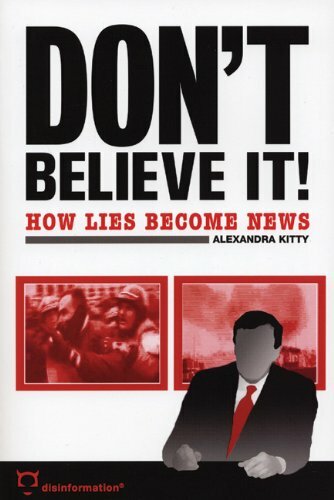 Alexandra Kitty has a long career in criminal investigations, and what she has uncovered in American (and Canadian) media is a crime of sorts: the media's claim to be reporting "news" isa fraud.This is a shocking book, not likely to be reviewed in your local newspaper, or in other commercial media. I bought the discs for one story, Homecoming, in the Love disc.I laugh every time I hear it. I purchased this instead of flowers for my daughter who was recovering from surgery. 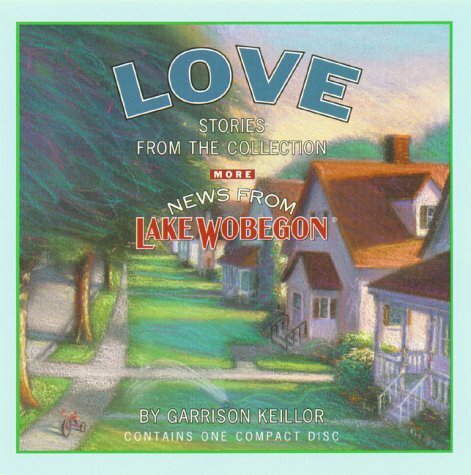 She is a great fan of anything Lake Wobegon and tells me this is also wonderful. 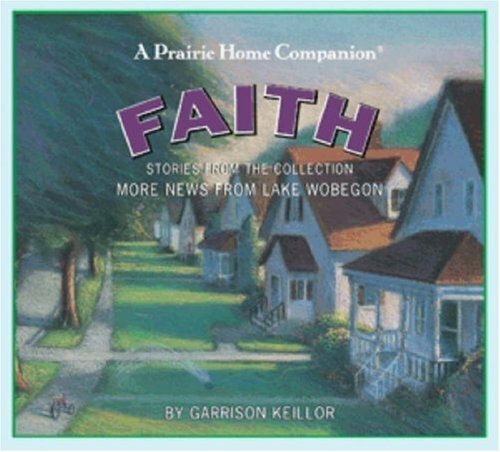 If you appreciate the wit and delivery style of Garrison Keillor, you will appreciate this CD. That is what she tells me. After she has listened to it for the thousandth time, perhaps I can borrow it and find out for myself. Most journalists would be familiar with the Associated Press Stylebook and Briefing on Media Law, better known as the "AP Stylebook". Well, this is the broadcast version. Written for activists, nonprofit organizations, or any concerned citizen, Making the News explains how to combine creativity with nuts-and-bolts media skills to score news coverage for important issues or nonprofit causes. Tactics? Yes. Strategy? No so much. 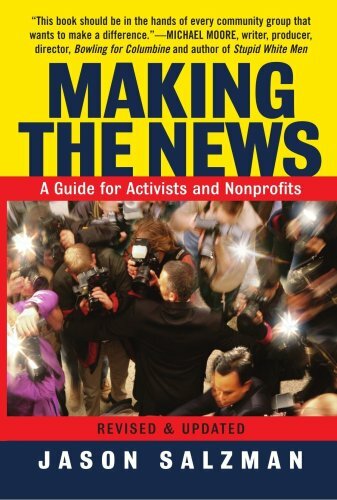 Making the News - A Guide for Activists and Nonprofits is an OK book. About one-third of the book covers strategic aspects of an activist media plan. That was the part in which I had an interest. I am always seeking a little more insight into the thinking behind the activist communications plan. However, the other two-thirds of the book was concerned with tactical matters. The third edition of Television News is ideal for preparing future reporters, who are increasingly called on to do it all. 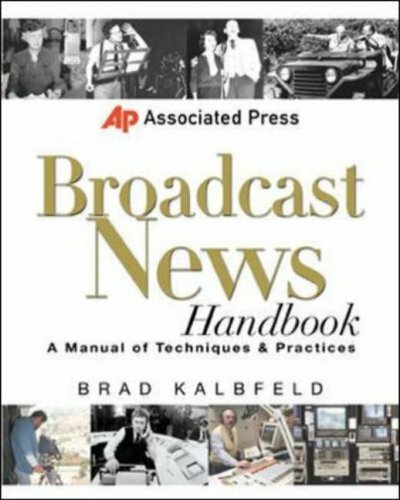 From the basics of reporting; to writing in broadcast and web style; to shooting, editing and producing broadcast--this text is an invaluable handbook. It can be used for classroom instruction and as a reference or instructional tool for those who continue to learn the craft in advanced classrooms and newsrooms. The authors know that truthful information presented ethically and accurately is a requirement of news reporting in our democratic society, and this book provides a foundation for skilled reporting that meets those objectives. Chapters on legal considerations and broadcast careers round out this comprehensive guide to the industry. An accompanying Web site will help students learn and review with writing, shooting and editing activities, web links and an introductory video. Television News can be used in stand-alone broadcast courses or across multiple specialized courses, thus providing consistency and a lower cost for students. 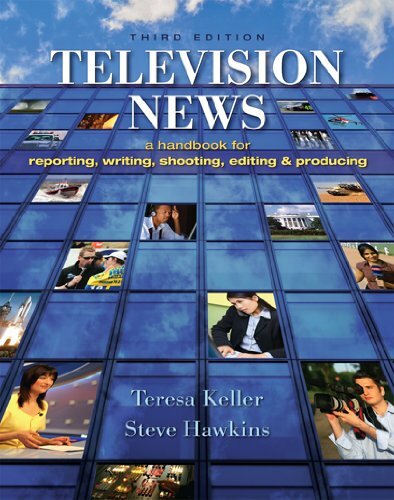 Whether students plan to work in more traditional newsroom roles or operate as a one-man-band, this book will prepare them for creating television news that is ready for the air or for the Internet. This digital document is an article from Performing Arts & Entertainment in Canada, published by Performing Arts and Entertainment in Canada on September 22, 1995. The length of the article is 742 words. The page length shown above is based on a typical 300-word page. The article is delivered in HTML format and is available in your Amazon.com Digital Locker immediately after purchase. You can view it with any web browser. From the supplier: Television news expert Tim Knight believes that television news needs to be presented with greater emphasis on the feminine aspect of the human psyche. Broadcast news since the 1940s has presented the masculine aspect to such a degree that it has removed itself from the true social make-up of the world. 17. 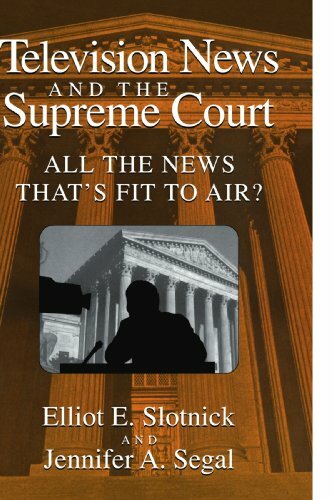 Television News and the Supreme Court: All the News that's Fit to Air? 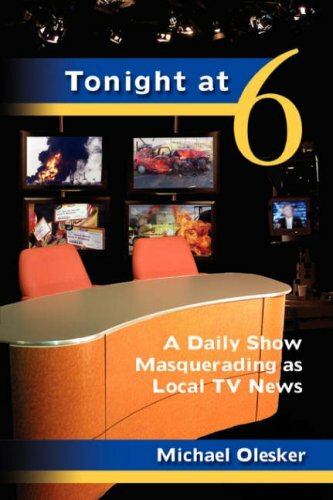 In this piercing look into the grit and the glamour of television news, award-winning journalist Liz Trotta traces her career from the early days of broadcast news to the slick superficiality of today. The first female television correspondent in Vietnam, Trotta tells the searing truth about being a woman in a male-dominated industry and recounts many of her most fascinating stories, from the scandal of Chappaquiddick to the campaign trail of George Bush. Filled with candid, often stinging assessments of the movers and shakers in the industry, Fighting for Air is the story of an uncompromising woman and of television news coming of age--told from the trenches. Elizabeth Trotta has spent her entire career in television news. You will not find a better qualified opinion of the current state of that media. She has exposed CBS and NBC (where she has plenty of personal experience) for what they have become. Since she has "blown the whistle" on the mass media, they have attacked her non stop. I also give her an A for putting up with the constant onslaught of criticism for having done so. She tells it like it is. Why would anyone buy her book if she is such a racist devil pig? 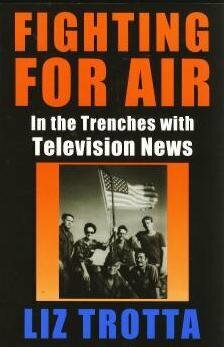 Trotta was one of the first female war correspondents on television.This book is a must read for her Vietnam reflections as well as her story of what it was like to be a woman in the network "boys club". Liz was an awesome reporter in Vietnam; she could get down and dirty in the mud with the troops in an era where talking heads reported from mahogany desks in NYC thousands of miles away. She was honest and conservative in an industry which was devaluing both. Finally she was a woman, one of the first to go into the jungle to get the tough stories. This is a compelling book of a great reporter's life,and the story of an amazing woman. Gee, I think Ms. Trotta would like to be given credit for the assassination of an American senator, eh?She would have felt right at home in Nazi Germany, where calling for the death of a political opponent was completely acceptable.